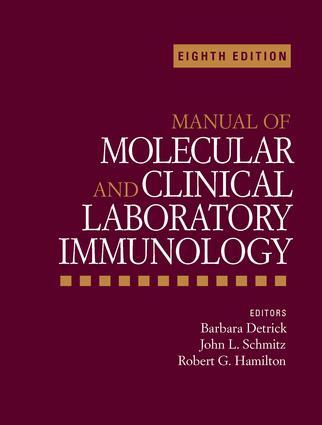 The Manual of Molecular and Clinical Laboratory Immunology is Regarded as the premier guide for the clinical immunology laboratory. From basic serology testing to the present wide range of molecular analyses, the Manual of Molecular and Clinical Laboratory Immunology encompasses the exponential growth in the field of immunology over the past decades. This edition reflects the latest advances and developments in the diagnosis and treatment of patients with infectious and immune-mediated disorders. Written to guide the laboratory director, the Manual will also appeal to other laboratory scientists in clinical immunology laboratories, and pathologists. It is also a useful reference for physicians, mid-level providers, medical students, and allied health students. with an interest in the role that immunology plays in the clinical laboratory.